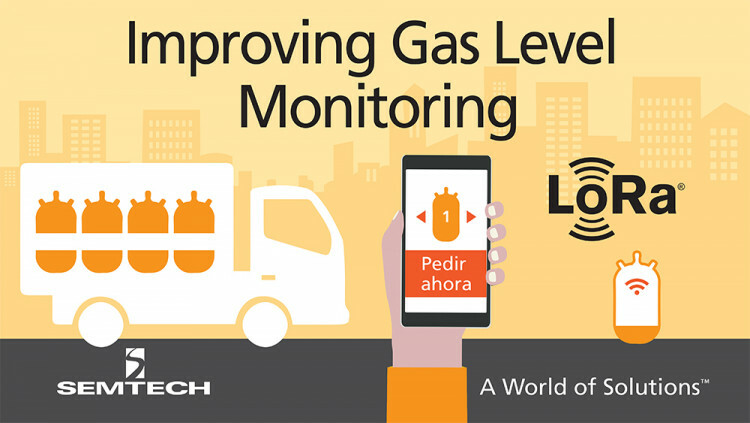 CAMARILLO, Calif., April 13, 2017 - Semtech Corporation (Nasdaq:SMTC), a leading supplier of analog and mixed-signal semiconductors, announced Butano24, a Spanish company delivering IoT devices that provide valuable data to energy and utility companies, successfully integrated LoRa® RF Technology in its gas level measurement application to intelligently monitor tank levels. The Butano24 smart gas bottle sensor uses an ultrasound solution to measure the gas level without requiring any modification or invasion of the bottle. If the level is low, a request for refill can be automatically triggered. This IoT solution helps distributors analyze the buying and consumption patterns of users, leading to a more efficient gas delivery mechanism that will give users more control over their orders. The solution also provides the distribution company with increased operational cost savings by ensuring inventory is on-hand and closely tracked at the right times. Semtech’s low-power LoRa Technology allows the solution to run on batteries for over 10 years while automating data transmission and enabling Cloud storage for real-time information and data monitoring. LoRa Technology is especially effective in sensor-based applications due to its low-power battery operation and long-distance communication capability in regional, national and global LoRaWAN networks. The Butano 24 Smart Sensor is planned for production during the last quarter of 2017 and can be adapted to measure other liquids, fluids, liquefied gas or combustibles in portable or fixed vessels. Butano 24 is a commercial name that belongs to Serviglp Sl which provides services to GLP distributers by capturing and processing bottled Glp client’s orders and sending them via Internet to the logistic delivery chain. The company also develops IoT devices to automatize and facilitate the relation between energy and utility suppliers and its clients. All statements contained herein that are not statements of historical fact, including statements that use the words “will,” “leading to,” “is expected to,” “designed to,” “could,” or other similar words or expressions, that describe Semtech Corporation’s or its management’s future plans, objectives or goals are “forward-looking statements” and are made pursuant to the Safe-Harbor provisions of the Private Securities Litigation Reform Act of 1995, as amended. Such forward-looking statements involve known and unknown risks, uncertainties and other factors that could cause the actual results of Semtech Corporation to be materially different from the historical results and/or from any future results or outcomes expressed or implied by such forward-looking statements. Such factors are further addressed in Semtech Corporation’s annual and quarterly reports, and in other documents or reports, filed with the Securities and Exchange Commission (www.sec.gov) including, without limitation, information under the captions “Management’s Discussion and Analysis of Financial Condition and Results of Operations” and “Risk Factors.” Semtech Corporation assumes no obligation to update any forward-looking statements in order to reflect events or circumstances that may arise after the date of this release, except as required by law. Semtech, the Semtech logo, LoRa and LoRaWAN are registered trademarks or service marks, or trademarks or service marks, of Semtech Corporation and/or its affiliates. Third-party trademarks or service marks mentioned herein are the property of their respective owners.